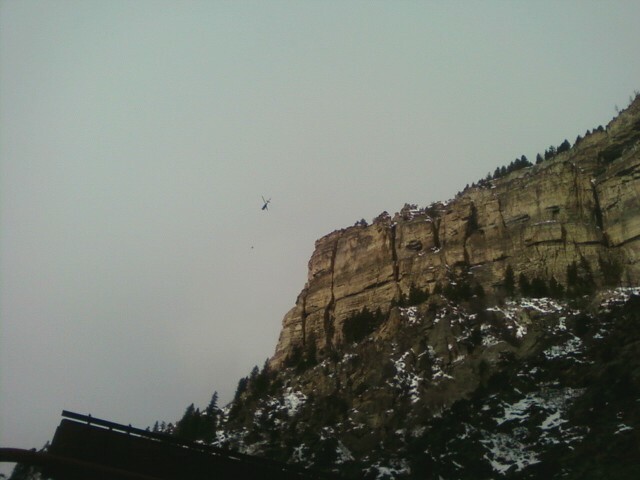 There is one lane open in each direction through Glenwood Canyon. The speed limit has been reduced to 40 mph and a 14 ft. width restriction is in effect. 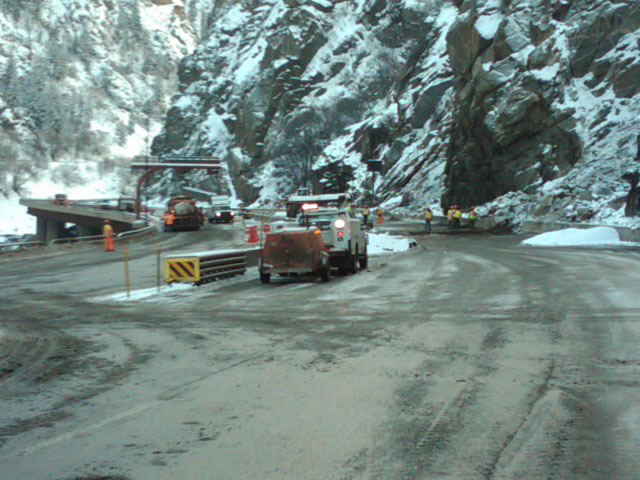 CDOT crews have opened I-70 through Glenwood Canyon in both directions. Traffic is reduced to one lane in each direction and will remain like this until long-term repairs can be completed in the coming weeks/months. The speed limit has been reduced to 40 MPH and load over 14-feet wide are restricted from traveling through the work area. CDOT wants to thank motorists and impacted communities for their patience during this time. More information to come tomorrow afternoon on repair plans. CDOT Maintenance crews began clearing snow in the canyon early this morning and are now beginning work to make the repairs necessary to open a single lane of traffic in each direction today. They are clearing rock debris from all lanes (the blast brought down some dozen larger boulders (4 feet) and many smaller rocks), making repairs to the drainage system and completing roadway patching in numerous places. Crews have already set up traffic control cones/barrels and signage on the Interstate so that when repairs are complete, the highway can open quickly. We will send notice as soon as a re-open time is set today. Our geologists returned from the rock mitigation site safely and were very satisfied with the work that was accomplished today. With the blasting, there was a clean break of the rock from the slope and all of the rocks we were concerned about were knocked down. As a result, mitigation work will not be required tomorrow. Since the blasting brought down additional rock, crews will have some cleanup work tomorrow along with drainage work and final pavement repair. The good news is that one lane of eastbound and westbound I-70 will reopen by the end of the day tomorrow. We will keep you posted as we get close to a reopening time. Crews blasted the large rock just before 6 PM. 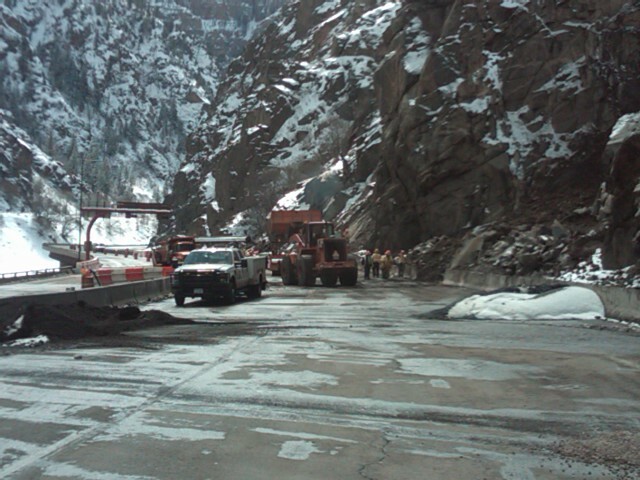 CDOT maintenance crews immediately began work to clear the debris on the highway. 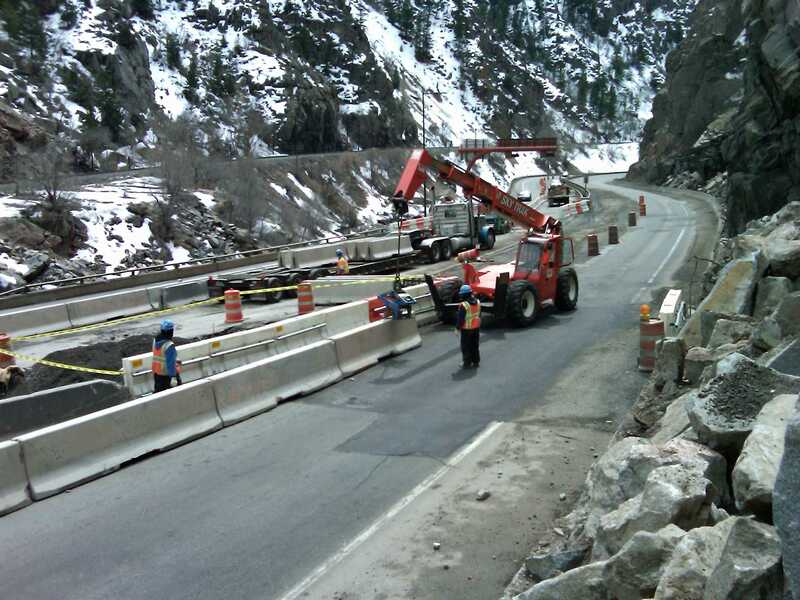 They have worked throughout the day making the repairs necessary to open a lane of traffic in each direction when rockfall mitigation is complete. Because daylight is fading, the highway will not open tonight. Crews will hike to the site tomorrow morning to conduct follow-up rock scaling and assess the stability. CDOT will make every effort to get some portion of the interstate open to traffic tomorrow, March 11. Be assured we will send an update as soon as we begin any procedures to open a lane. Crews are working through the slow, technical process of drilling the rock and prepping the area for blasting operations—it is estimated that this will take until 4 or 4:30 PM. 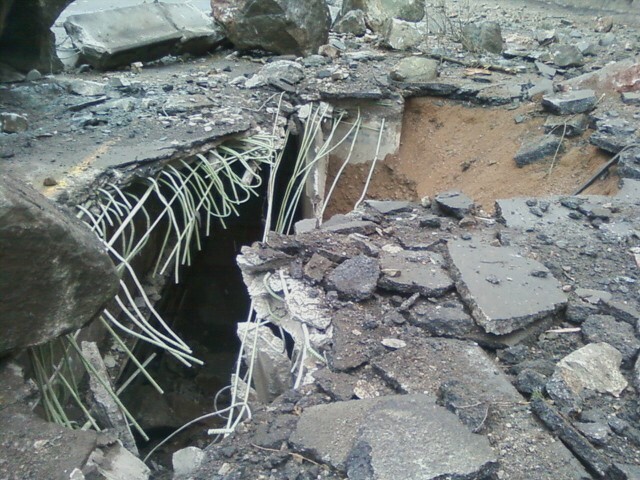 After this time, we will send notice of blasting results, clean-up work required, and the follow-up process/estimated schedule for getting traffic flowing again. The helicopter is on scene—ready to drop off drilling equipment and a generator for planned drilling/blasting operations. 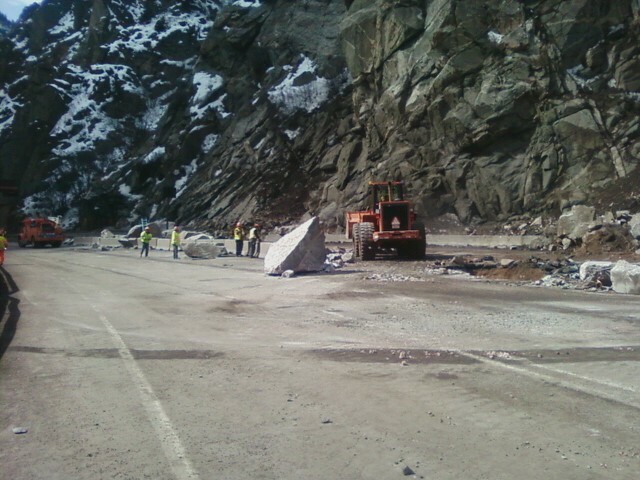 If all goes well, crews anticipate bringing the boulder down early afternoon. When the boulder is down, the hillside scaled and stabilized, and any resulting highway damage is assessed, we can begin to send information regarding estimated highway re-open times. We will send notice as soon as the boulder is down. A team of six hiked up 900 feet on the mountainside today and conducted rock scaling operations (removing loose rock material with pry bars and other equipment) until approximately 5:30 p.m. They were able to safely access the unstable rock needing to be brought down. Losing daylight, crews attempted to pry sections loose and locate areas in which to effectively place and then charge explosives, but were unable to do so. Tomorrow, March 10th, crews will hike up to the location once again and drilling and other equipment will be airlifted by helicopter to the site. Drilling and blasting as well as other mitigation efforts will be used to bring down the rock. Due the challenging nature of the project, it is difficult to estimate when the mitigation work will be complete and when I-70 may reopen. Should the rock be brought down successfully, causing minimum damage to the highway, crews could then begin repairs to the eastbound lanes in preparation of opening one lane in each direction using the eastbound lanes. Please note that the process to reopen the Interstate is dependent upon the completion of the mitigation work. An update will be sent mid-morning on March 10th. Scaling is still underway. We will know much more when work is complete later this afternoon. We will send any information we might have regarding possible re-open times as soon as possible. 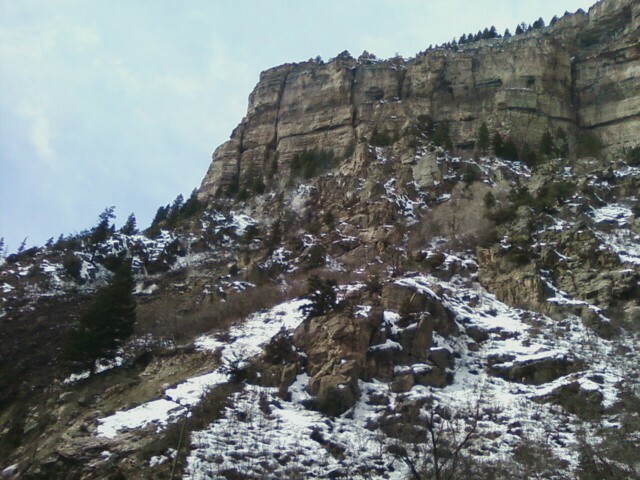 Crews have begun their hike up the hillside in Glenwood Canyon and will begin rock scaling by around 10:00 A.M. They will start scaling above the unstable rock and work towards it with the goal of prying it loose and/or gaining a better understanding of its stability. The rock is approximately 20 feet in diameter. CDOT crews are completing work for the night – conditions are now too dark. I-70 will remain closed overnight. 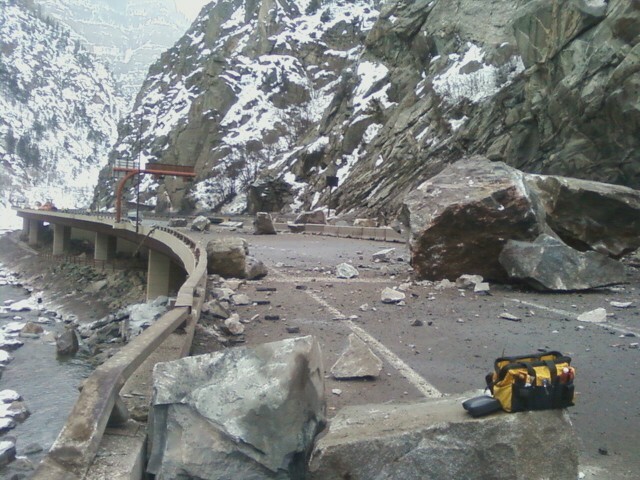 CDOT geologists have determined that the rock above the highway is too unstable to remain in place. Early tomorrow morning, Tuesday March 9, rock scaling crews will be meeting to determine how best to mitigate the rock. 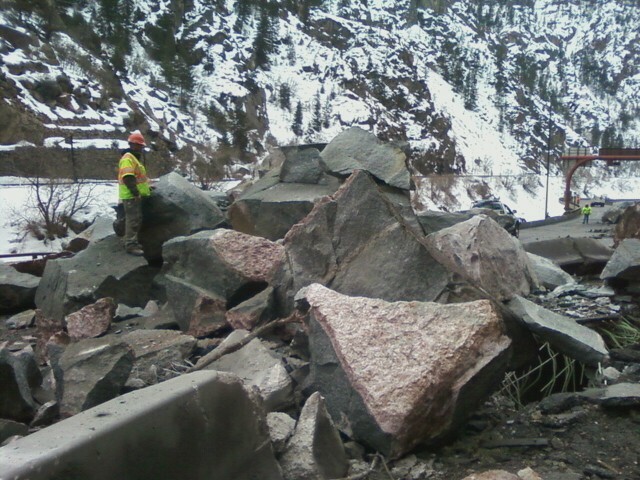 CDOT geologists are on site and are in the process of assessing a rock that appears to be unstable. The assessment requires a two-hour hike up the mountain, inspection and a two-hour hike back down. 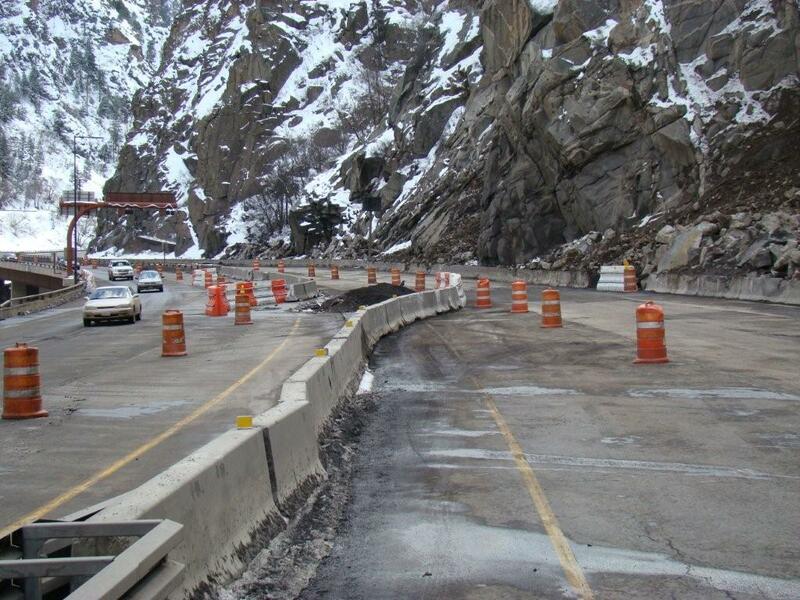 If the rock is determined to be unstable, CDOT will not reopen any lanes of I-70 until rockfall mitigation can be conducted. Since the assessment will take several hours to complete, mitigation work will not take place until tomorrow as it will be unsafe to conduct the work at night. 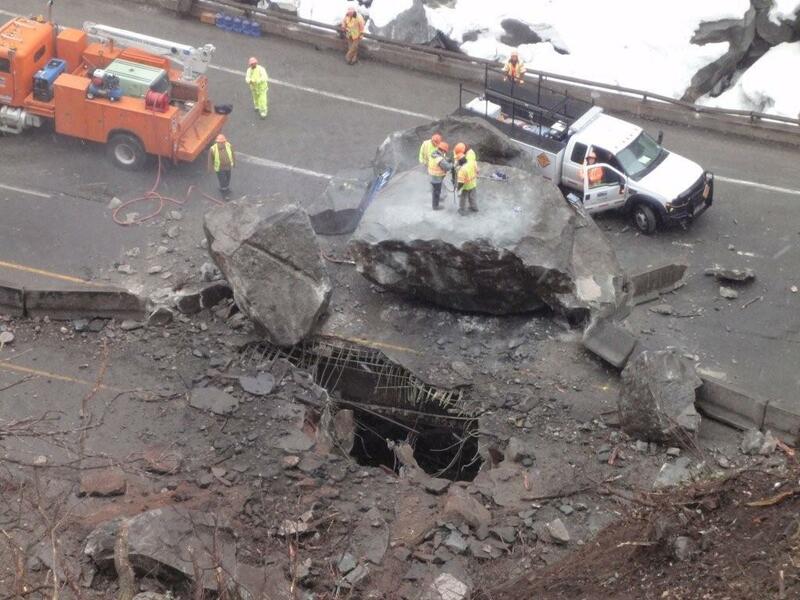 In the meantime, crews continue to blast the large boulders into smaller pieces for removal (photo attached). So far, crews have blasted three rocks and have several more to blast apart. This work will continue this afternoon. More information will be released following inspection of the rockfall site. 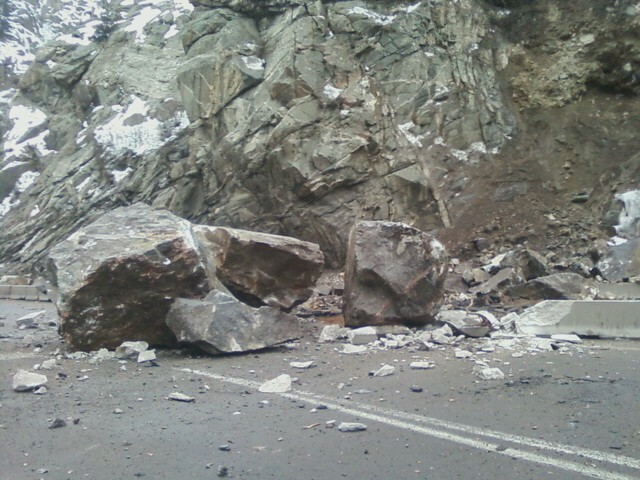 UPDATE: Rockfall in Glenwood Canyon, news release, March 8, 2010, 10 a.m.
From westbound I-70: exit at US 40/Empire to State Highway 13 and back to I-70; exit in Silverthorne and take State Highway 9 to US 40 and State Highway 13; exit at Wolcott/State Highway 131 to US 40 and State Highway 13. From eastbound I-70: exit at Rifle/State Highway 13 to US 40 and back to I-70. 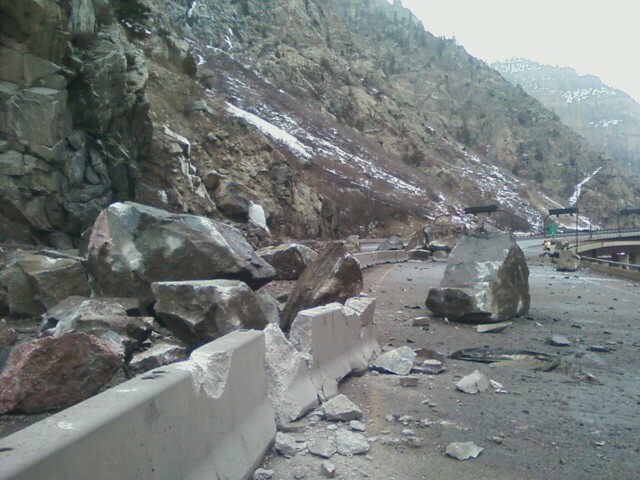 CDOT crews are on site assessing the slide area and damage to the roadway. Stacey Stegman is on site, but out of cell phone range.